The Fourth Global Report on Decentralization and Local Democracy (GOLD IV) – Co-Creating the Urban Future explores how the New Urban Agenda can be achieved everywhere, in cities and regions large and small. It will be launched on the 15 October at the UCLG World Congress in Bogotá. 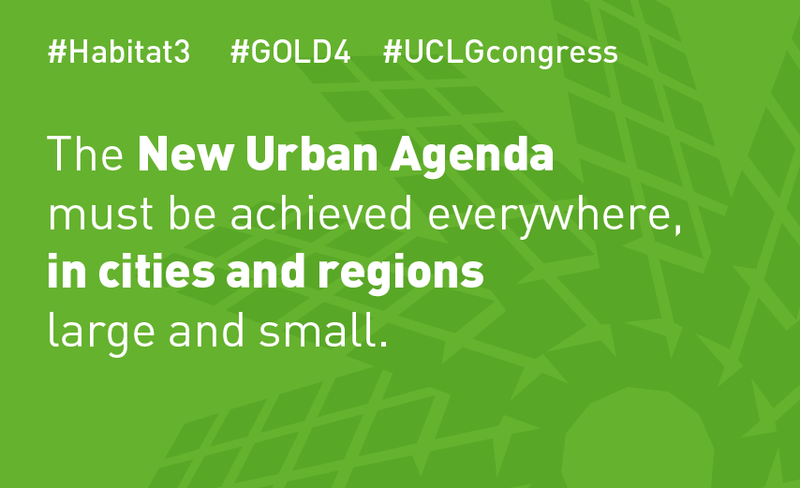 GOLD IV – Co-Creating the Urban Future will be launched at the UCLG World Congress in Bogotá. The report provides the evidence base for the Global Agenda of Local and Regional Governments, a set of policy recommendations for everyone involved in the future of metropolises, intermediary cities and territories. GOLD IV puts local and regional authorities at the centre of the New Urban Agenda, focusing on policies that – with the involvement of citizens and communities – have the potential to transform human settlements around the world. Co-creating the Urban Future follows the methodology of previous GOLD reports. It was drawn up by specialists and academic, based on a series of consultations with elected local leaders and local government professionals. This combination of academic rigour and practical experience is what makes GOLD IV a unique contribution to the global debate on urban sustainability. The report argues that the contribution of local and regional governments will be essential to the achievement of the SDGs, the Paris Agreement on Climate Change and the New Urban Agenda, and that different local contexts - metropolitan areas, intermediary cities and territories - provide different challenges and opportunities for sustainable development. The GOLD IV recommendations show how the New Urban Agenda can be implemented on the ground. They also call for a greater role for local and regional government networks in global governance, and for the reform of international financing to support sustainable infrastructure and accessible, inclusive services and rights.